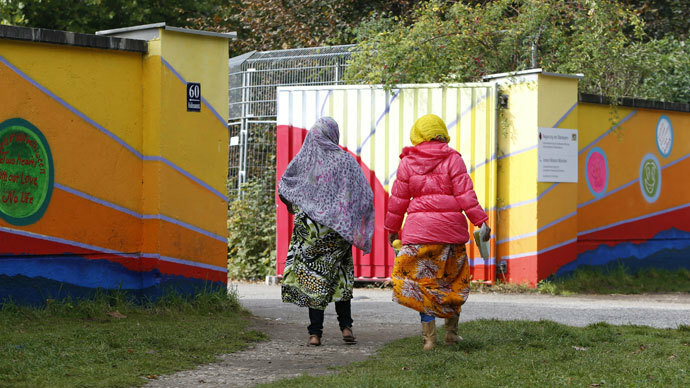 A school in Bavaria, Germany, has sent a letter to parents, asking them to ensure their daughters refrain from wearing revealing clothes, because refugee accommodation has been set up next to the school’s gym. Two hundred Syrian refugees have been living for a week near the Wilhelm-Diess-Gymnasium’s gym, Die Welt reported. The gym was shut down and PE lessons relocated to a primary school in the vicinity. The head teacher also rushed to inform parents about additional security measures. "For the refugees, access to the school gardens and buildings is strictly forbidden. The same goes for the school grounds during the day. The number of teachers on duty during breaks has been increased," Martin Thalhammer wrote. He went on to warn the students against wearing immodest clothes. "The Syrian citizens are mainly Muslims and speak Arabic. The refugees are marked by their own culture. Because our school is directly next to where they are staying, modest clothing should be adhered to. Revealing tops or blouses, shorts or miniskirts could lead to misunderstandings," Thalhammer added as quoted by the Local. In addition, the school asked to refrain absolutely from "direct eyeballing, ogling or taking pictures." "Derogatory or racial remarks cannot be tolerated in any way," the letter concluded. "These boys, who come from a culture where for women it is frowned upon to show naked skin, follow girls and bother them without realizing. Obviously, this is a matter of concern for us," he continued. "It was my responsibility to remind everyone that two cultures are coming together here," the head teacher added. Over the past few years, Germany has welcomed around 100,000 refugees from war-torn Syria — substantially higher than other EU nations, human rights activists estimate. The government expects the number of people seeking asylum to jump to 450,000, a record for Germany. A week ago, thousands attended the pro-refugee protest in Berlin, with about 2,500 people expressing their views in favor of immigration and their concern at how the EU authorities treat those coming from conflict-hit zones. However, it should be noted that anti-immigration attitudes have also gained ground in Germany. At the beginning of June, the far-right, anti-immigration Pegida party came fourth in mayoral elections in Dresden, winning almost 10 percent of the votes.